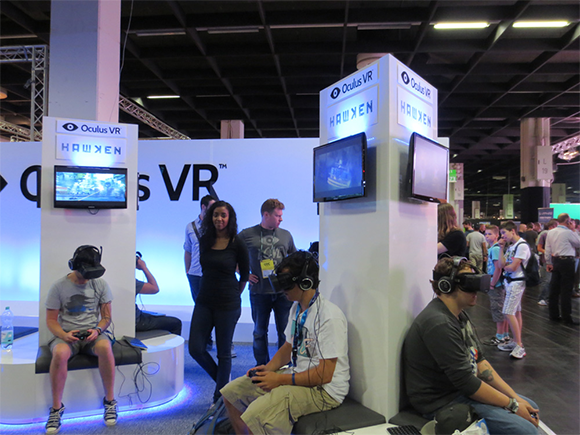 Recently at GamesCom I was able to try the VR headset Occulus Rift for the first time. I was lucky enough to try the new HD Prototype. From what I understand, this is very close to the final product that should release in 2014. I played a couple of minutes of Hawken. Here are some of my impressions. In some respects it was a sobering experience that de-mystified a lot of my preconceptions of Virtual Reality. In other ways I was still blown away by it. In any case, I think it is a fascinating and important device. So far, most of us have learned about Virtual Reality almost exclusively from Hollywood movies. The Occulus Rift represents a pallet cleanser and establishes a precedence to productively discuss the technology. Does it feal like actually being there? No. Which was the sobering part. There are multiple effects that will ensure that the user will never think that they are doing anything else than having a small LCD screen strapped to their face. Lack of optical focus – While the Rift does show the world in stereoscopic 3D, one of the things that we should be slowly learning from the recent hype for 3D movies is that depth perception seems to be a phenomenon that goes beyond mere stereoscopy. One important aspect of how humans judge scale and distance is by using the focus of their eyes. Put your finger close to your eye and focus on it. The everything further away will become blurry. Focus on something further away and the finger will become blurry. This is one of the reasons why we can usually judge very well how close things are in the immediate vicinity – close enough so we can touch it. The effect becomes less pronounced with distance. But in our everyday life we constantly re-focus on various things around us. The Rift lacks this. The image is projected by a special lens in a particular way so that all the light rays come in parallel as if they came from far away. Your eye focuses in the distance. So putting it on, instead of the 3D image wrapping snugly around you, to some extent it remains removed and not immersive at all. This is not a design error, it is just a natural limitation of the system. Low resolution and a screen door effect – I was shocked by how low the resolution is, even though this was the HD version. The problem here is that while the display is pretty highly resolved, it covers your entire field of view for both eyes. So you end up staring on just a tiny portion of the available resolution at a time. The result puts you back into old VGA times. If you have a realistically-sized speedometer in a car sim, you will probably not be able to read the numbers on it. 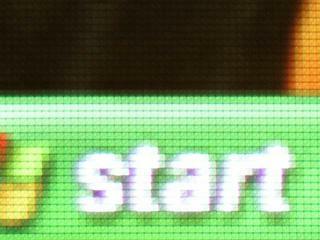 Do add insult to injury, the LCD screen is optically magnified. So you end up seeing the gaps between the individual LCD pixels. The good news is that unlike the focus issue, this aspect will likely get better with future iterations of the hardware. Low dynamic range – Because you are looking at a standard RGB screen, you will only see light from a fairly low dynamic range of intensity. For example, if you look at the sun in the virtual world, it will not blind you. This seems like a petty issue but I think this lack of fidelity does put a huge damper on how real the image appears. Especially in a cockpit situation, you are usually sitting in a dark environment while looking on a very bright world outside of your windshield. The Rift dulls out this contrast and it ends up reminding you that you are actually just looking at a screen. Restricted field of view – Finally, the image doesn’t cover the entire field of view. There is a small but noticeable border. Supposedly, the coverage is pretty good compared to other systems and it is not a show stopper. However, it is one additional reminder that erodes the illusion. The good news is that it is very easily to get lost in the image. After a few minutes you get used to the artifacts and get lost in the game. Then again, that’s kinda what happens with video games in general. It is hard to say if the Rift feels more immersive than a regular screen simply because there is no way to measure immersiveness. However, there is one effect I and the two guys with me experienced which is certainly something a regular screen doesn’t produce. Walking around in Hawken didn’t feel exceptional. But then we engaged the jet pack. Holy smokes! Flying with the Rift is an incredible experience. It feels truly astonishing! There is a real feeling of actually lifting yourself into the sky, a real sense of height and depth. Even though there are no acceleration forces, some part of my brain was just completely fooled. So every time I turned off the jet pack and started falling, my stomach started to churn like in a roller coaster. I had serious inhibitions of letting myself fall all the way to the surface. I eventually did fall to the ground at a speed that would kill me in real life. It felt unsettling. Despite of all the technical imperfections, that feeling alone made all 3 of us walk away ecstatic. How it feels like when using the Rift. This is the question I found most intriguing. Most people seem to want to use it for 3D shooters. That will do in the short term. However, there is an important thing that I realized: in order to make the Rift REALLY shine the game must reward you for being able to look around. You see, a regular shooter couples your walking direction with your viewing direction. So you always walk and shoot in the direction you look. This is not practical for the Rift as you would have troubles turning around 180°. Besides, in real life, you head and your body can rotate independently. The obvious solution is to uncouple the looking direction and the walking/shooting direction. You use the controller (or mouse) to move the cross-hair as regular. But additionally, you can move the camera away from the cross hair by turning your head. This works but it causes other problems. In practice, it is just so much easier to flick the analogue stick to look around rather than turn your entire head. So playing and FPS you will just end up staring straight ahead and moving the field of view with the controller as you are used to. This renders the whole head tracking functionality of the Rift completely useless and lessens the immersion. You just don’t get the opportunity to experience how you head is embedded in the virtual world if you end up never moving it. The Rift shines in games where the thing you control turns SLOWER than you can turn you head. These are basically any kinds of simulation games: flight simulators, spaceship simulators, racing games, truck simulators, etc. Any game, where you control some kind of vehicle that has some inertia to it. Hawken may be a Mech simulator, but it is just too fast for the Rift to be of use. You need something where there is an advantage in looking around. The fact that simulation games often simulate an activity that is performed while sitting in a seat also helps reducing the dissonance. From our short experience with the Rift, games where you fly around have an additional advantage. I haven’t witnessed any high-speed movements yet. They may also be impressive. All in all, this and what I wrote yesterday suggests a very bright future for simulation games. Will we all be trucking with our Rifts? I guess we find out next year. Nice post, I’m super jealous that you got to go to GamesCon and try out the rift! Also, did you manage to swing by the Wildstar booth? Ummm, you should do a blog post about GamesCon in general too! I had the opportunity to test the racing game demo at GC. Even if I had no control over the car, my heart rate went up and I started to grin. My body just reacted to the movement and I couldn’t resist. I also reached out to the cockpit switches, they looked like they were there. The resolution was a slight disappointment, especially with the hud I couldn’t even read. But after some time it didn’t bother me anymore. The head tracking on the other hand seemed super fast and lag free. I would love to have a rift + kinect 2 combo in which you can move your hands around and see your own virtual hands/claws/paws. JD – I couldn’t get a definitive answer from the guys at the booth but the HD Prototype I was playing was already a resolution upgrade compared to the Dev Kits they give out. Michael – Good to hear that the speed works well! I was suspecting something like this. You probably had the better Rift game. It’s interesting that the cockpit worked so well for you. Perhaps Hawken’s cockpit just wasn’t so great. I didn’t have that reach-out feeling you described. I agree that you got used to the low resolution after some time. I see a lot of possibilities to it! Why stop on simulators/first-person games? I think it could be a great substitution to the mouse for RTS games: you’re God (or at least have God-like vision, map fog aside) and can freely move the camera “from the air”. I think it would be awesome, for example, to play some title of the Total War saga controlling the camera with this, where you could focus the view in different skirmishes on the map just by moving your head. Aaaa! Is already featured on the Occulus VR website. I’m skeptical about RTS. Occulus is not really good at conveying a lot of information due to the low resolution. Moving the map with your head is a huge can of worms. For example: If your head movement doesn’t just pivot the camera like in an FPS, you lose the entire Virtual Reality idea.